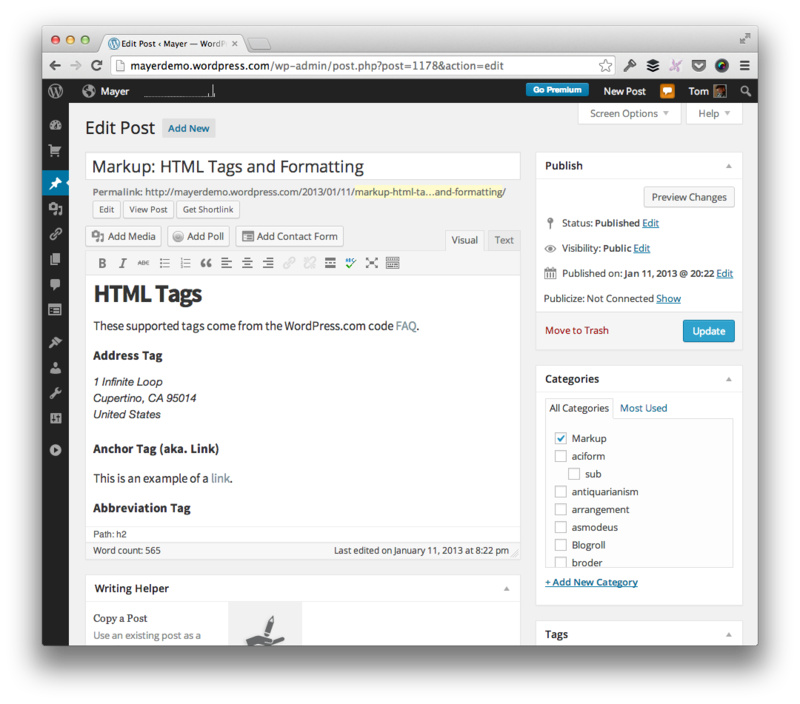 Mayer is a theme for the long-form writer, established blogger, and inspired author. It’s designed to stay out of your way so that you can focus on what matters most – writing. It also has native support for mobile devices so that your content will look great regardless of if your readers are following your content on their desktop, their tablet, or their phone. Activate Mayer, optionally define your social networks in the Theme Customizer, and then begin writing. There are no settings pages, additional widgets, or confusing options to distract you from publishing great content. Mayer is ready for you to begin publishing as soon as you activate it, and are ready to begin writing. Out of the box, Mayer is designed to look great on all devices. This means that if your readers are following along on their desktop, their tablet, or their phone, then they’ll receive the same view of your work regardless of where they are. You’ve written your content under the impression that it will appear a certain way – why should a plugin or additional customizations change that experience? One of the cumbersome aspects of publishing content using WordPress is that you’re never quite sure how your words will appear when you’re done drafting them. With Mayer, you never have to leave the editor. What you see while drafting is exactly what your readers will see – no more toggling back and forth between both views of of your website. It’s designed to be what you see is what you really get. By design, Mayer is for the single-author blog. Regardless of if you’re a veteran blogger looking to change up the presentation of your content, or you’re someone who’s just getting started with sharing your thoughts with the world, Mayer was designed with you – not a group of authors – in mind. Mayer was created with the philosophy of decisions, not options. That’s why there are no theme options. Every decision that was made when creating this theme was done strategically to give you one of the best writing (and reading) experiences that you can have. The same philosophy will be applied as Mayer continues to grow. From the very beginning, Mayer was built with the inspired writer in mind. It doesn’t matter if you’ve been blogging for years, or if you are just getting started, Mayer aims to make it as easy as possible to install a theme, then begin writing – arguably the most import aspect of blogging.